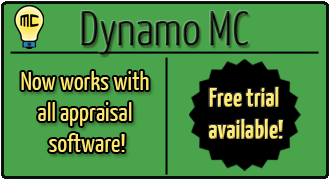 Get started with a free trial of Dynamo MC today to see for yourself how it can improve your appraisals. Dynamo MC now works with all modern appraisal software, including ACI, Bradford ClickFORMs, and TOTAL. Dynamo MC saves you time by automating the market analysis and documentation on every appraisal. It completes the entire 1004MC using your MLS data and your own conditional comments. It also creates the best looking charts in the appraisal industry, many of which can help to explain and predict market trends using regression analysis. Dynamo MC allows you to share an amazing amount of information with your clients with just a few clicks, so you’ll be saving time on every report. Since Dynamo MC tells the story of your subject’s market, you’ll also receive fewer callbacks about market conditions. Dynamo MC can import and export in a variety of ways, so please choose the option which works best for you. Appraisers using TOTAL or WinTOTAL Aurora by a la mode, inc can export their Dynamo MC results directly into their appraisal reports. This option requires an account and payment through the TOTAL store. Appraisers can also choose to use Dynamo MC to create a standalone PDF document. This PDF can either be used on its own, or digitally imported into any modern appraisal software. This option requires a Dynamo Appraiser account and an active subscription. For more information on the available ways to use Dynamo MC, please check our licensing and pricing page.